With Cambria being the Latin term for Wales it would be legitimate to wonder why a hotel deep in the Bernese Alps should have been named after such a distant region. 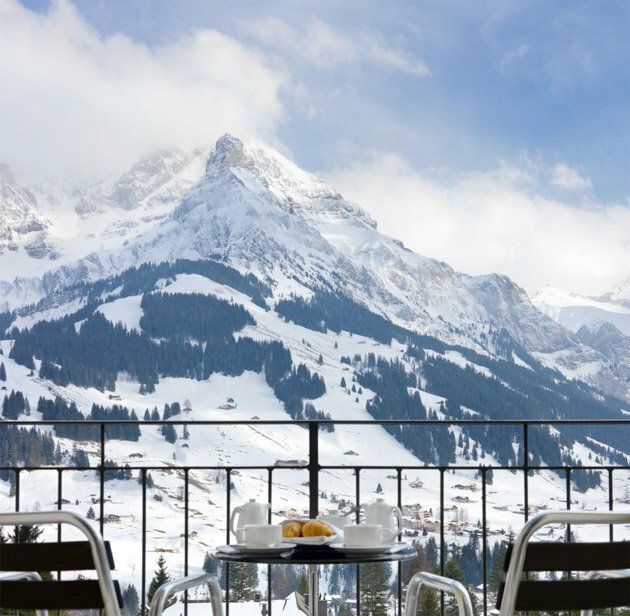 The answer lies with Grant Maunder, Welshman and financier, who having developed a deep love for Adelboden during childhood holidays, grabbed an opportunity to purchase the dated Grand Hotel Regina and make it something rather better. The transformation to the Cambrian Hotel is an unqualified success. 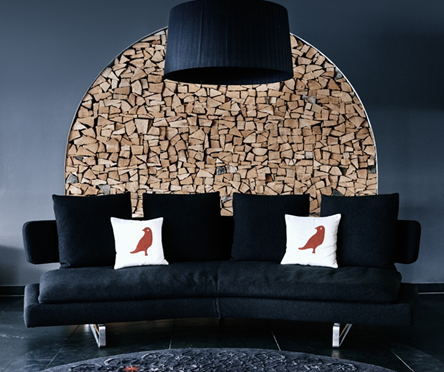 Natural mountain materials are brought inside with the lobby floors featuring swathes of grey stone contrasting with the rich wood of the reception, and the neatly stacked firewood that fills architectural spaces. 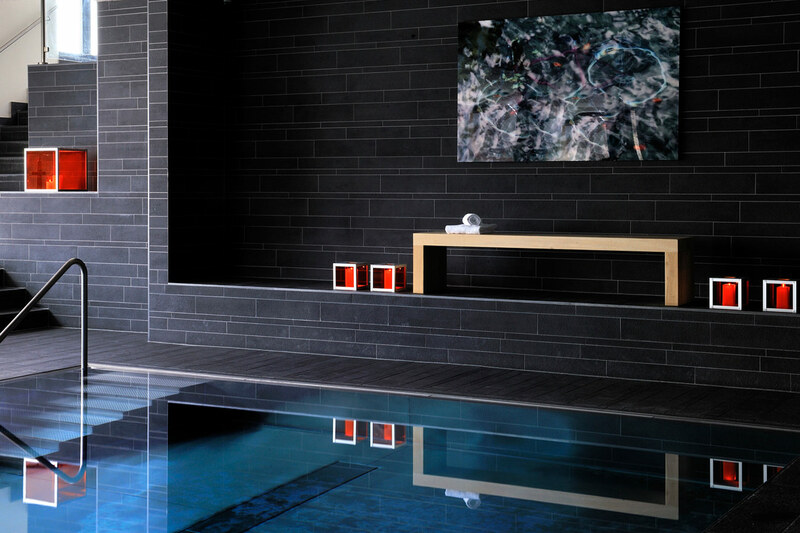 The same slate that no doubt refers back to the famous grey slate of the Welsh mountains, is also found forming the chimney breast of the fire, the floors of the lounge as well as surrounding the pool and styling the spa. No expense has been spared on the interiors with design classics from the likes of B&B Italia, Porada and Knoll to be spotted everywhere. Meanwhile filling wall and floor spaces are eye-catching examples of contemporary art and sculpture. Even the hotel’s meeting rooms have been transformed – this time into a modern version of a Victorian library with wallpaper of book spines and furniture salvaged from the odd scrap yard, and London’s Spitalfields market. 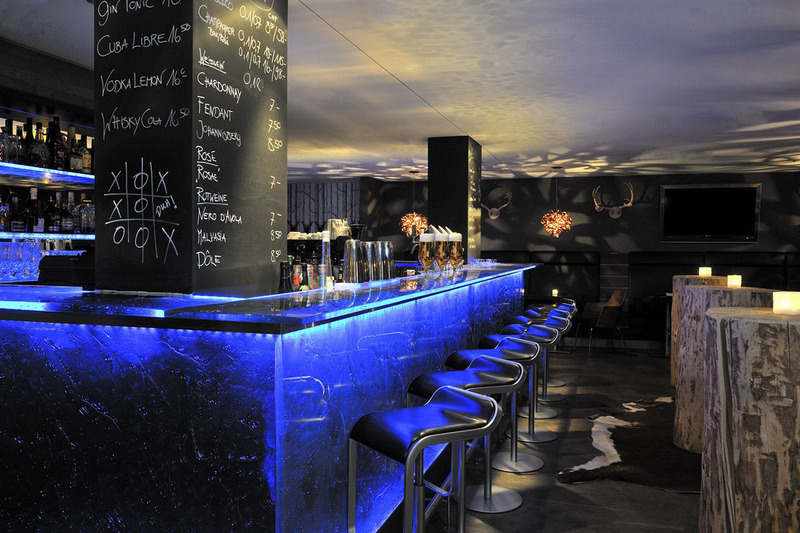 Fascinating and quirky items like a black and white cow hide effect painted on the piano, a giant black foot in the stairwell, and a bar lit in an icy blue all add further to the considerable visual appeal. The hotel’s seventy-odd rooms are calm, stylish and comfortable without being over-designed. Barcelona chairs sit adjacent to the picture windows, and there are neat balconies on many rooms from which to enjoy the with their amazing mountain views (pick south-facing rooms for the most spectacular). The king beds have very comfy mattress toppers and rooms offer plenty of storage, whilst bathrooms have handy automatic lighting, walk-in showers with two shower heads and Orla Kiely toiletries, a few suites have baths. There is free wifi but some may miss other extras like a minibar, snacks, coffee machine, tea or biscuits. 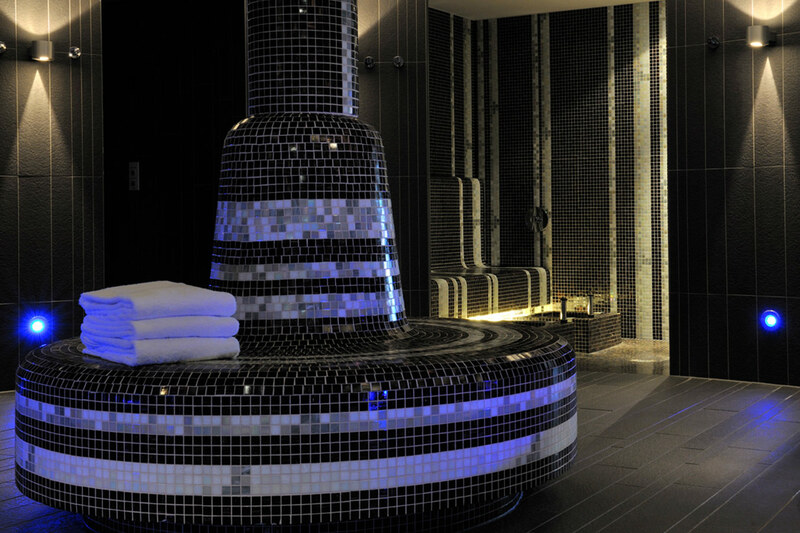 The Cambrian’s spa is a welcome treat after a hard day skiing. The indoor swimming pool is bathed with dimmed midnight-blue lamps and the ceiling sparkles with tiny bulbs that twinkle like stars. The outdoor mini pool slash oversize hot tub with its varied jets and bubbles, is the perfect place to admire the sweeping alpine scenery whilst a Finnish sauna, steam room, rain shower and sleeping area complete the experience. We should not forget the wonderful hot and cold breakfast buffet, with lots of healthy options, included in most room rates. 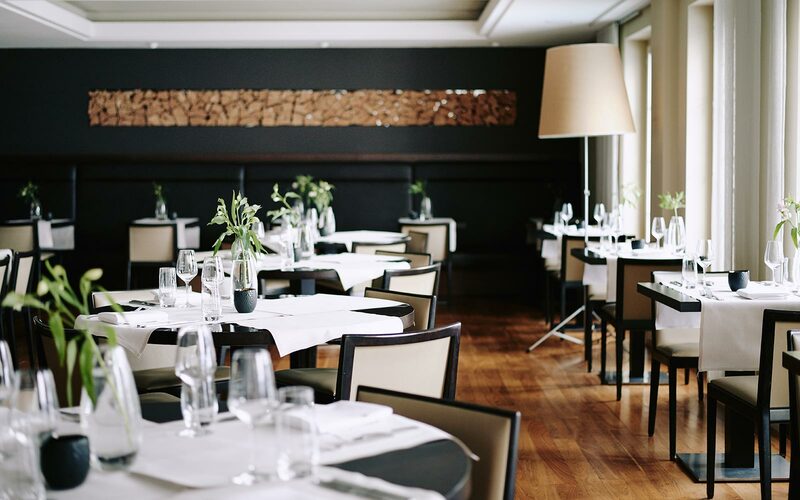 In the evening, the breakfast room morphs in to an equally impressive fine dining venue offering ‘New Alpine cuisine: a fresh interpretation of mountain classics’ with the possibility to add a fine wine pairing if you wish. 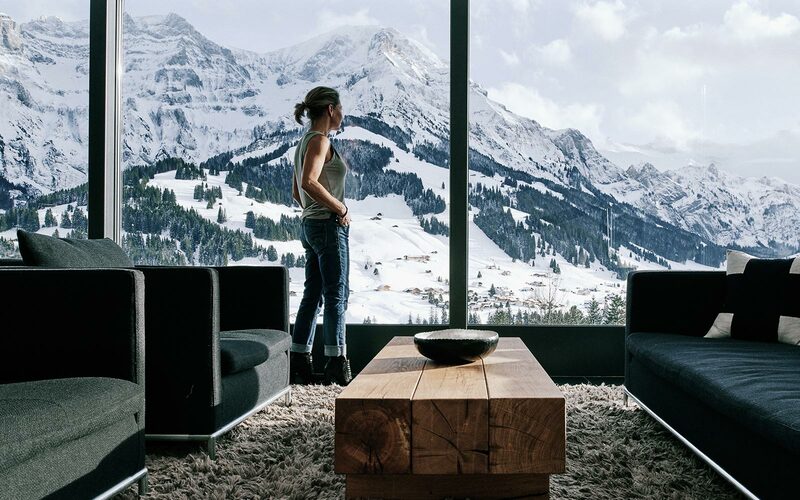 Adelboden’s excellent ski area, connected with that of Lenk, is a five minute clomp from the hotel along a the pleasant main street – rent from the very helpful Aellig Sport adjacent to the lift for extra convenience – or take advantage of the Hotel’s free shuttle. Skiing not your thing? The Cambrian will arrange anything from shopping trips to dog-sledding to spending a night in an igloo. 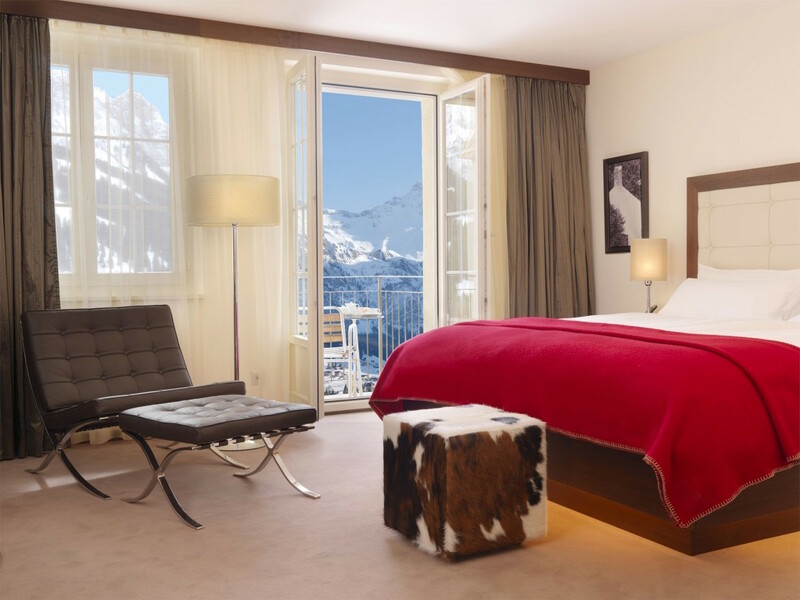 This is a seriously good Alpine hotel where you can enjoy one of Switzerland’s top three ski areas without the crowds or prices of the ‘big name’ resort. No doubt summers are great here too. Trust us – put this high on your list for a future Alpine break. 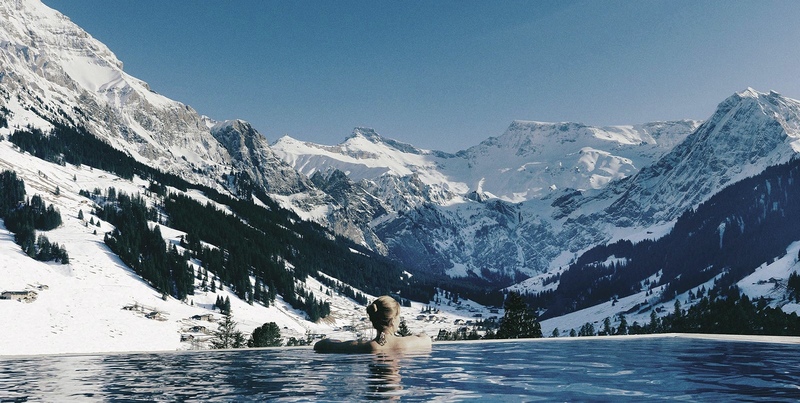 CELLOPHANELAND* were guests of the Cambrian Hotel and Adelboden resort.